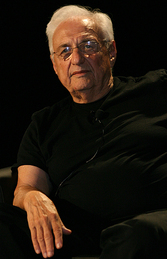 A hallmark of Frank Gehry's career has been his use and development of computer-aided design to create unusual architectural shapes. Frank Gehry, who is among the world’s most prominent and innovative architects, has been named the Judge Widney Professor of Architecture by USC President C. L. Max Nikias. Judge Robert Maclay Widney founded USC in 1880 and played an important role in the growth of Los Angeles as an urban center. The title that bears his name is reserved for eminent individuals from the arts, sciences, professions, business and community leadership. Gehry’s faculty appointment will be in the USC School of Architecture, from which he earned his Bachelor of Architecture degree in 1954. Winner of several of the field’s most significant awards, Gehry has designed distinctive museums, concert halls, offices, homes and other public and private buildings across the globe and throughout California. Among his most iconic works are the Guggenheim Museum in Bilbao, Spain, and the Walt Disney Concert Hall in downtown Los Angeles. Completed in 2004, many consider Disney Hall, with its whimsically curved stainless steel exterior, to be the city’s most important contemporary structure. Elizabeth Garrett, USC provost and senior vice president for academic affairs, sees Gehry as an ideal fit with USC’s academic values. Gehry was raised in Toronto, Canada, and moved with his family to Los Angeles in 1947. In addition to attending USC, he studied city planning at the Harvard University Graduate School of Design and served in the U.S. Army. Already an award-winning architect with his own firm, Gehry became widely known for his cutting-edge design in 1978 after enclosing the first floor of his Santa Monica home in corrugated metal and chain-link fencing. A hallmark of his career has been his use and development of computer-aided design to create unusual architectural shapes. Gehry has several projects currently in the design or construction phase, including the Guggenheim Museum in Abu Dhabi, the Foundation Louis Vuitton Museum in Paris and Beekman Residential Tower in New York City, which will be his first high-rise building to be completed. His numerous awards include the Arnold W. Brunner Memorial Prize in Architecture, the Pritzker Prize and the National Medal of Arts. He also has received many honorary degrees, including one from USC. The Huffington Post reported that USC alumnus and architect Frank Gehry has been named Judge Widney Professor of Architecture at the USC School of Architecture. Gehry, a Pritzker-winning architect who graduated from the school in 1965, said that he carries with him many life lessons learned at USC. The Huffington Post ran an op-ed by Elyn Saks of the USC Gould School about the stigma associated with mental illness. “People who wouldn’t dream of saying a racial or ethnic slur glibly talk about nut cakes, lunatics and crazies,” Saks wrote. “Perhaps they stigmatize the mentally ill because society always marginalizes people who are different. Or people may blame the person, not realizing that mental illness is a no-fault brain disease that you can’t just will away.” The story noted that she is the author of “The Center Cannot Hold: My Journey Through Madness” and the recipient of a MacArthur Foundation “genius” grant. Los Angeles Times quoted Manuel Pastor of the USC College about the pervasiveness of pollution in some low-income neighborhoods, and noted that he directs USC’s Program for Environmental and Regional Equity at the USC Center for Sustainable Cities. Los Angeles Times quoted Rebecca Lonergan of the USC Gould School about the legal complications that ensue when a police officer is charged with corruption. Al Jazeera (Qatar) interviewed Clayton Dube of the USC U.S.-China Institute about Chinese President Hu Jintao’s visit to the United States.